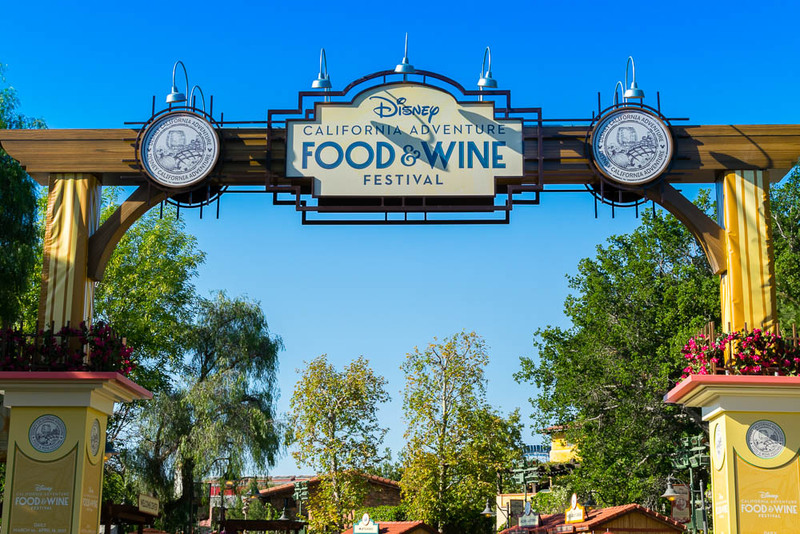 This past weekend we were fortunate to be able to head to Disney California Adventure Food and Wine Festival. The festival started on March 10th and will run through April 16th. It features a variety of food kiosks, educational tasting seminars, lifestyle seminars, culinary demonstrations and more. You can even get a passport (for free) to help keep track of your culinary journey. There are 15 food kiosks throughout Disney California Adventure. Most are located along the path from A Bug’s Land to the Paradise Pier area. There are also a few kiosks in Hollywood Land. Each location’s menu is inspired by “fresh, California-grown ingredients like Gilroy garlic, Meyer lemons, savory olives and artisanal cheese.” The beverages offered are locally brewed craft beers and wines from all over California as well as some non-alcoholic beverages. 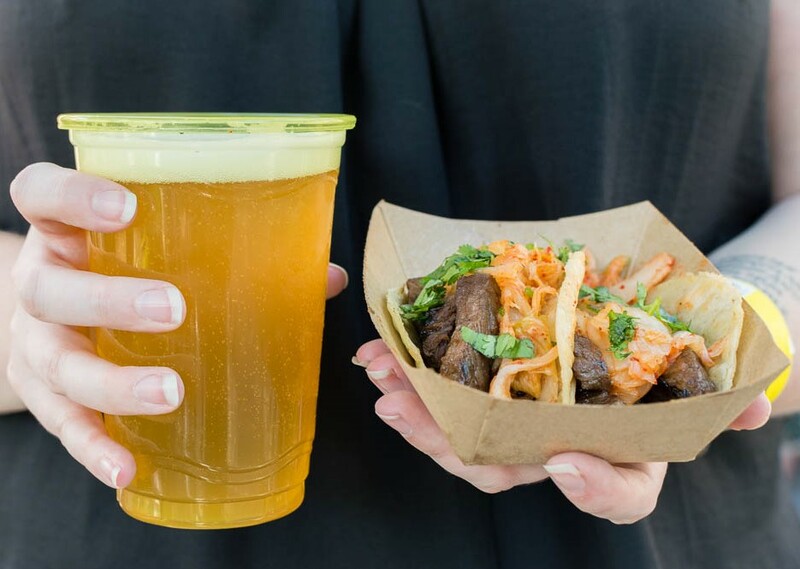 Korean Barbecue Beef Short Rib Tacos with Kimchi Slaw from LA Style– It comes as no surprise that tacos made it to our top 5 list. However, these tacos were added because of how delicious they were. Not because they are tacos. The beef was tender and loaded with flavor that held its own against the kimchi (which was also fantastic). Black Garlic & Soy-Braised Pork Belly Bao with Pickled Vegetables from Garlic Kissed- We are suckers for bao. Anytime we see it on a menu we usually order it. The bun was nice and fluffy. The pickled vegetables were so good that they almost upstaged the pork! Lasseter Family Winery Enjoué Rose from Uncork California– We love a good rosé! On a breezy spring day full of gorgeous sunshine like this past weekend, it is the best wine to drink! The Lasseter Family Winery’s rosé is a perfect example of the wine. It is crisp and refreshing! You can be sure we will be trying to purchase a bottle or two. Meyer Lemon Macaron with Blueberry Marmalade, Meyer Lemon Cream, & Blueberry Dust from Lemon Grove– We tried a few desserts during our time at the festival. 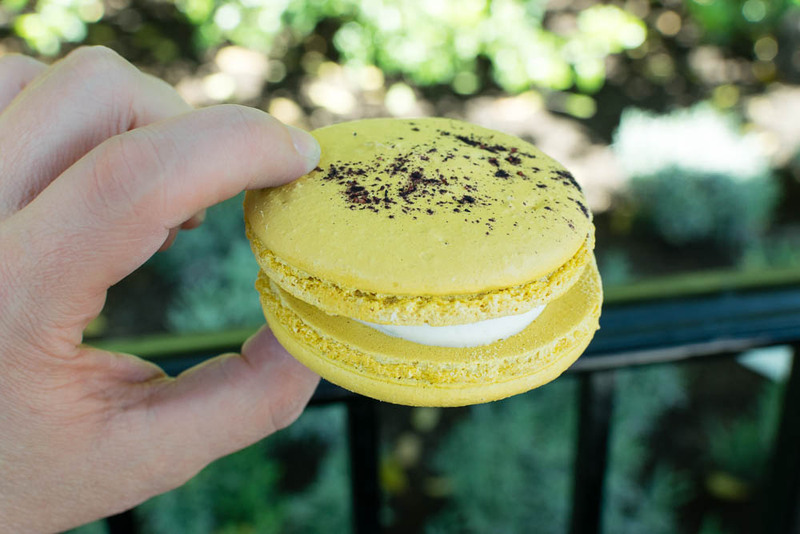 However, we kept coming back to the Lemon Macaron as our favorite. The blueberry marmalade really took it to a whole new level of yumminess! Sweet Corn Nuggets with Beef Chili, Spring Onions, & Sour Cream from Off the Cob- While this may not have been they fanciest dish we tried, it was a total win. 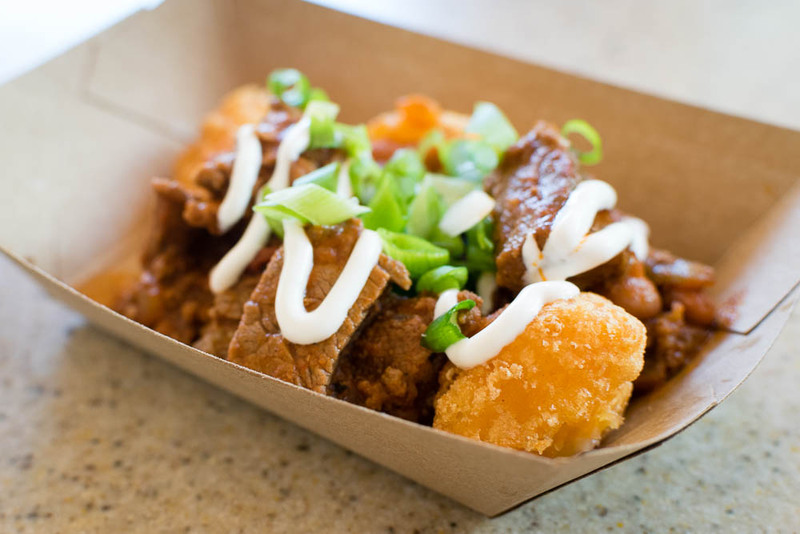 Think of a grown-up version of Frito Pie. Though instead of Fritos, you have delicious sweet corn fritters. This was definitely a favorite of the day. In addition to visiting the kiosks, we purchased tickets to one of the wine tasting seminars. Each seminar features a different winery. For our seminar, we tasted from Duckhorn Vineyards. Our tasting was led by their Vice President Neil who guided us through a tasting of their Sauvignon Blanc, Chardonnay, and Merlot. These tastings are a great way to try some wines that are not offered at the other kiosks. We loved challening ourselves to complete our Tasting Passport! Getting to visit the Happiest Place on Earth is always a treat but its even better when you get to eat treats! 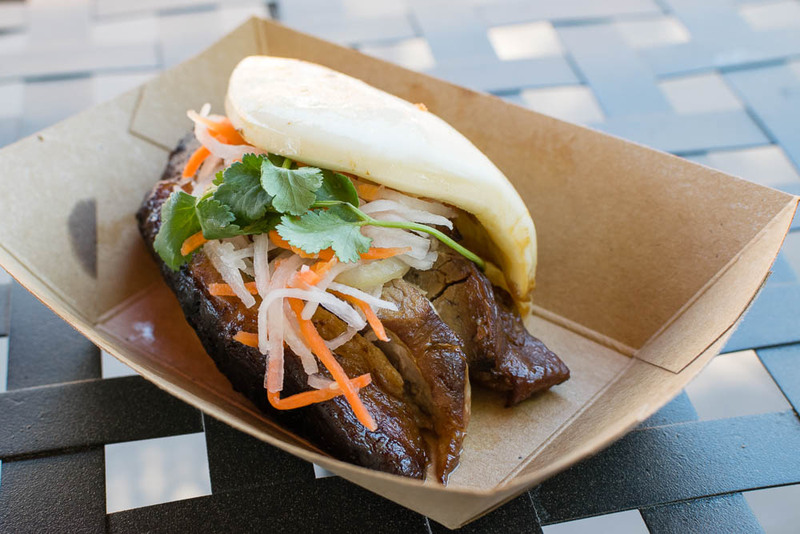 Have you visited the Disney California Adventure Food and Wine Festival? What was your favorite thing you ate? There is still a few weeks left to visit if not! 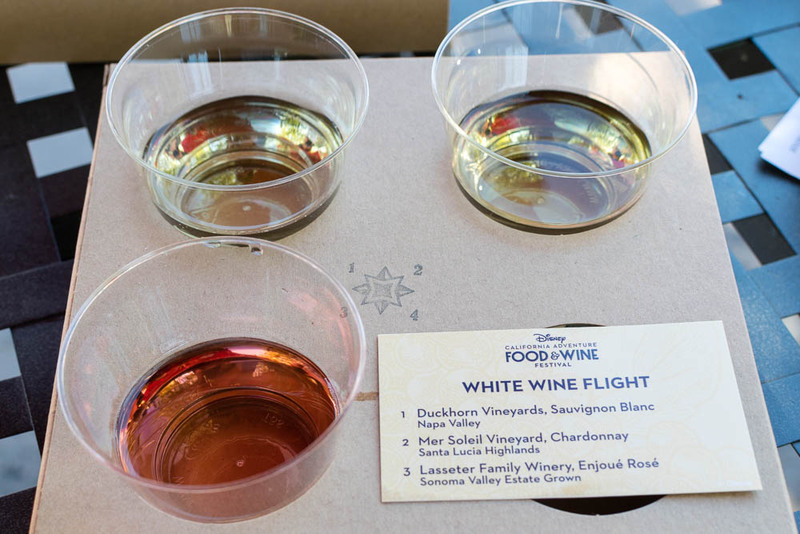 *We received complimentary Disneyland passes to facilitate this write-up but all food, beverages, and additional Disney California Adventure Food and Wine Festival experiences were purchased by The Geeks; our opinions are wholly our own. View our Disclosure Policy for more info.